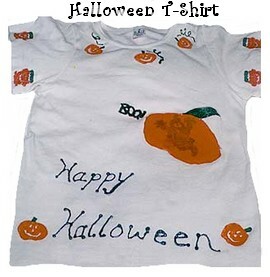 Get creative with fabric paint and decorate a plain white t-shirt for Halloween. Wash and dry your t-shirt with out fabric softener (including dryer sheets). Softeners will leave a film on the fabric that will not allow the paint to adhere properly. Lay your shirt flat with a cardboard piece inserted in the t shirt to prevent the paint from bleeding through to the other side. For this shirt only a few chunky stamps were used. A spider for the back, pumpkin for the front and a witch is stamped inside of the large pumpkin. The large pumpkin was drawn by hand as well as other details. Stamp your shirt as desired and with a paint brush, fill in any areas that did not stamp well. Once you have painted your shirt and are happy with the design, be sure to heat set the paint according to manufacturer instructions. Heat setting only requires that an iron [setting suitable for fabric] be placed over the painted design [with a press cloth or other cloth between the paint and the iron] to heat set the paint. Your shirt will then be washable and though it is said that you can place these in the dryer, I don’t recommend it.